Every May the Philadelphia neighborhood of Kensington gathers to celebrate homespun ingenuity, functional sculpture, and human-powered transit at the Kensington Kinetic Sculpture Derby. One entry this year is a remarkable combination of youthful enthusiasm, alternative education, and neighborhood pride- built by a small band of El Centro high school students to celebrate Habitat for Humanity’s efforts to provide affordable housing. The designers are “over-age, under-credited” youth, or students who lack the appropriate number of school credits for their age and intended grade. These students are often on the verge of or have dropped out of school, for a range of reasons including; financial instability, failing grades, parenthood, or bullying. With only roughly half of Philadelphia students graduating high school on time, there is a moral and economic imperative to educate and inspire struggling students towards personal sustainability as working adults. El Centro del Estudiantes, or El Centro as it is called for short, is an alternative high school in the Kensington section of Northeast Philadelphia that caters to students who have dropped out of traditional high schools. The academic program is experience-based, with students earning 80% of their credits through community internships with local businesses and nonprofits. These experiences give them exposure to a variety of professional fields and help them build skills for their futures. El Centro opened in 2009 through a partnership between Congreso de Latinos Unidos and Big Picture Philadelphia, a national nonprofit that has opened alternative schools across the country including the first local one in 2005 in Camden, NJ. Jesus, along with his classmates and advisors (the El Centro term for teacher) was inspired by the local rowhouses in the Kensington section of the city. 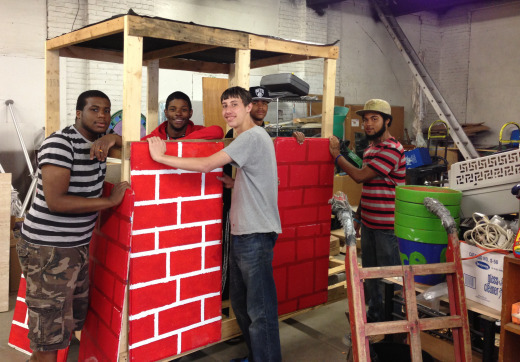 Together they have designed and partially built their float using almost all donated or salvaged materials, and if all goes according to plan they will be ready to reveal their masterpiece this Saturday at the race. Morgan is the Director of Community Engagement for Grid Magazine and in her spare time (big laugh!) she is a full-time Master of Sustainable Design graduate student at Philadelphia University. She is really proud of her roof-top deck garden.